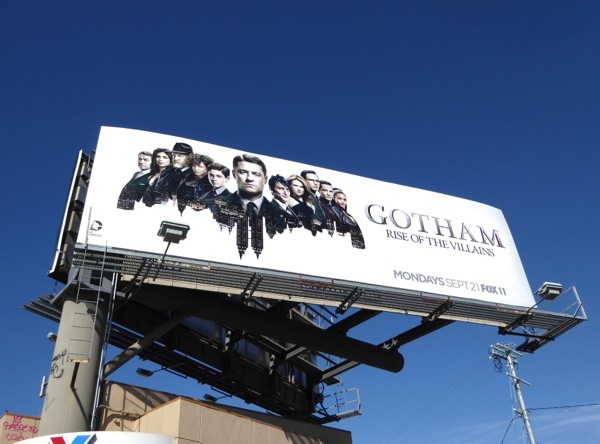 "Holy Smokes", is that a Bat-Signal we see rising for the sophomore season of Gotham, or is it in fact time for the 'Rise of the villains'. 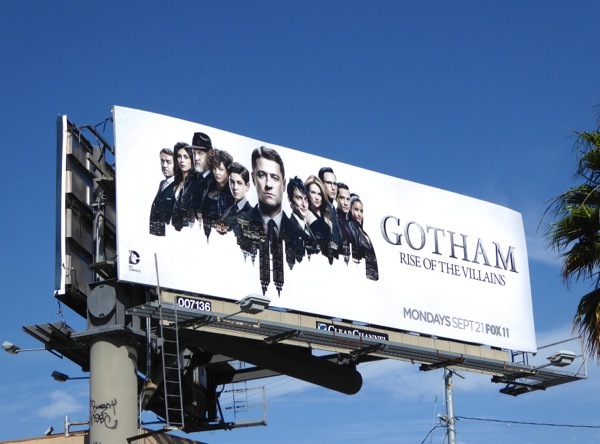 If you didn't think there were enough gangsters, crime bosses and classic Batman villains to shake a Batarang at in the first season of Gotham, then it looks like this new season of the Batman prequel will be the one for you. 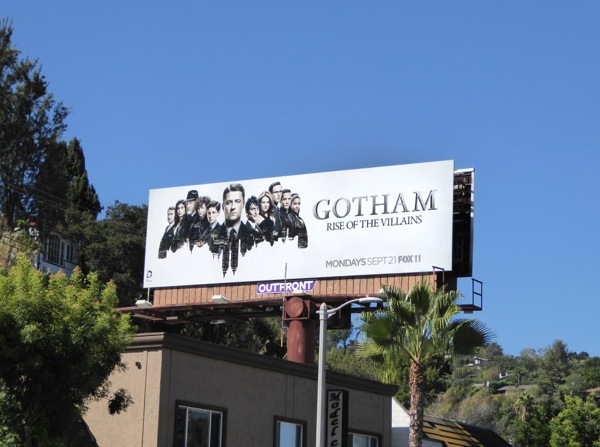 Ben McKenzie returns as 'Detective James Gordon' to face a new king of crime in Gotham in the form of 'Oswald Cobblepot' aka 'The Penguin' (deliciously played by Robin Lord Taylor), now that Jada Pinkett Smith's scheming 'Fish Mooney' is swimming with the fishes. In addition to a new boss and the season divided into two eleven episode arcs, expect more foes from the Caped Crusader's pantheon, like 'Mr. Freeze', 'Clay-face' and 'Firefly', to grace the seamy streets and join the neophyte 'Catwoman' and 'Riddler'. And did someone say 'Joker'? 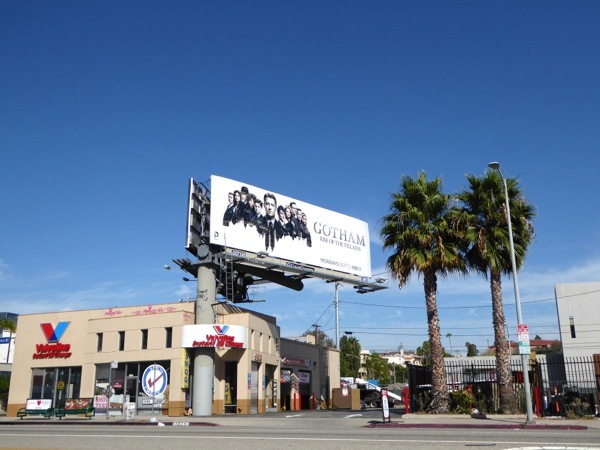 These clever Bat-Signal inspired season two billboards for Gotham were spied along Santa Monica Boulevard in West L.A. on August 30, plus days later above Ventura Boulevard in Studio City on September 7, 2015. 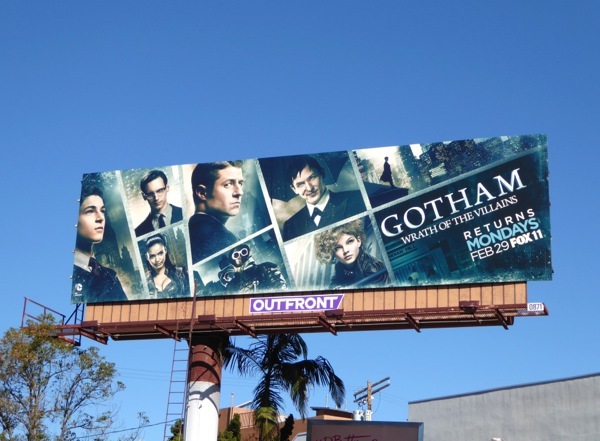 If you're a fan of the show inspired by the DC Comics, be sure to also check out these Gotham season one billboards and also take a look at all these Dark Knight movie billboards. Now that the characters and landscape of Gotham are much more established, let's hope the introduction of more of Batman's arch-enemies will inject some excitement into the often gloomy detective show. 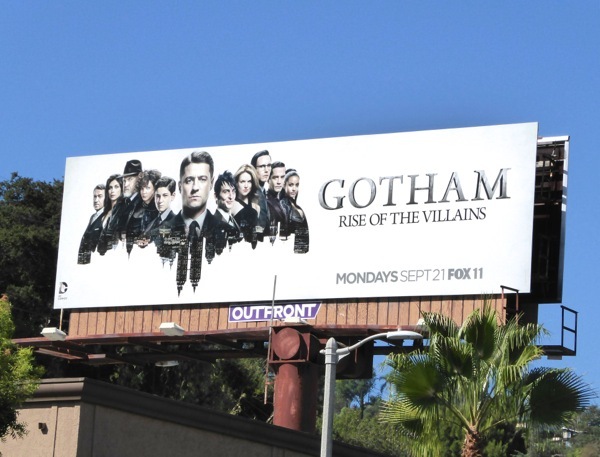 UPDATED: Gotham is back from its midseason break with this 'Wrath of the Villains' ad creative. 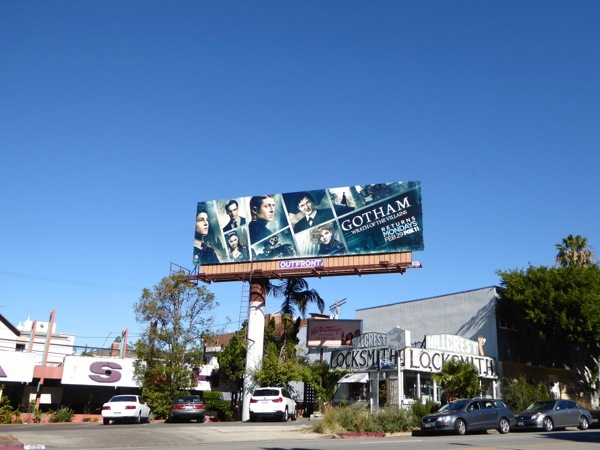 This sophomore season billboard was snapped along Pico Boulevard on February 5, 2016, and it looks like keeping Gotham's city streets safe is going to be more difficult than ever.